After showing everyone the various parts of the machines, I put an old or blunt needle in each and I had them “sew” on the lines while the machine was unthreaded. The object is to get every single hole touching the line on the page, and when we did this in my home ec class in middle school, the teacher circled any errant holes (if we had more than three, we’d have to repeat that sheet). You start with straight lines, then corners, then a spiral, and finally wavy lines. My girls did great, but opted to redo the last two sheets to get some practice in! They all said that this really helped them to get comfortable with the machine and said the curves of the bag were way easier because of it! Then we moved on to BurdaStyle’s (free!) Charlie bag pattern, and I showed them how to trim and tape the pattern pages together, then how to lay out the pieces and obey grainlines and learn how to find the selvedge. I really didn’t like that BurdaStyle’s instructions have you trim off the seam allowances on the bag handles and then overlock them (wtf? What beginner sewer has access to an overlocker??) so I had my girls make a facing for the top of the bag. It got them to practice sewing curves, the importance of clipping the seam allowances, and flipping inside out! And I personally think it’s less fiddly than bias binding when you’re just learning. I found it really fiddly to fit the bag into the pouch, and frankly, it takes up less room in my handbag to just fold it in half and roll it up, so we didn’t make the pouches! So my method for sewing the Charlie bag is the following. I tried to do a photo tutorial so it really would be useful for beginners but my photos were really not clear enough to be helpful. So consider these a helping hand for existing sewers wanting to teach newbies. With right sides facing, place the curved edges of the bag and facing together. At the ends of the handles, fold back 5/8” of the facing. Sew the bag and facing together along the curves, stopping at the folded edge of the facing. 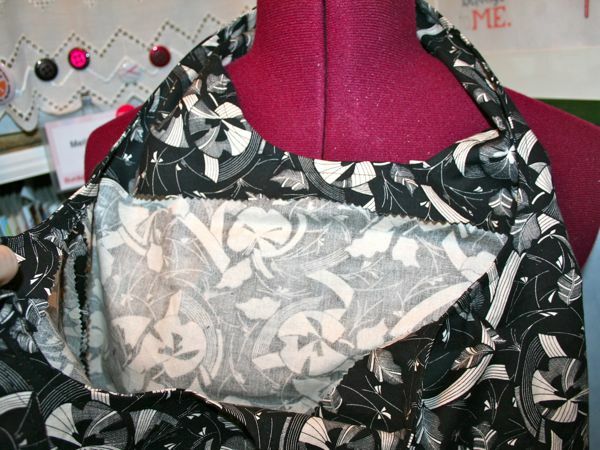 Clip the curved seam allowances, flip the handles right sides out, and press. Strut into work/school the next day with your finished bag! 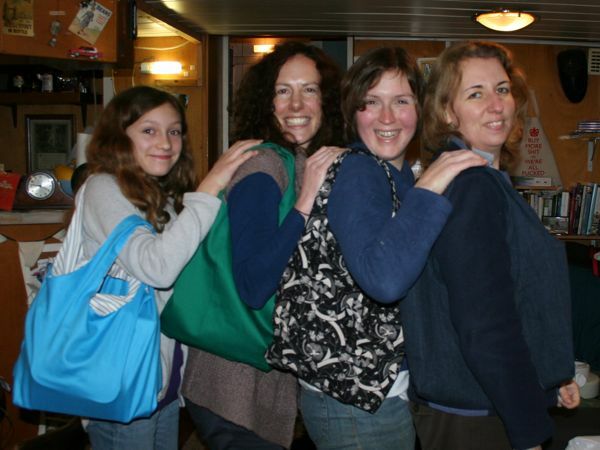 And here we are with our finished bags! L-R: Veda with her turquoise bag with a stripey facing, Nessa with her vibrant green bag, me with my black and cream bag, and Holly with her denim bag (bought from the offcuts table at Dittto a few weekends ago!). 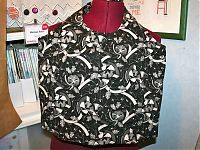 Separator image Posted in Gallery and tagged with bag, burda-style, tutorial.